The oceanic crust represents two-thirds of the globe and is created at the mid-ocean ridges from magmas extracted from the mantle and transferred to the surface via a complex magma chamber (Figure C). The main objectives of this sub-programme are (i) to characterise the functioning of oceanic magma chambers and understand the accretion mode of the oceanic lithosphere, (ii) to characterise the interactions between the hydrothermal circulation and the magmatic system, and (iii) to quantify the contribution of the most superficial magmatic levels (that have experienced strong interaction with the hydrothermal system) to the accretion of the lower crust. This section closely associates field observations, petrographic study of samples, and elemental and isotopic geochemical measurements. Recent geophysical data reveal the presence of magma lenses at different levels of fast-spreading ocean ridges : at the Moho, both on and off the axis ; in the lower crust ; and at the transition between the lower and upper crust. Each of these levels will be studied in detail to develop a coherent model for the entire magmatic system. The presence of magmas at distances of up to 20 km from the ridge axis, is rarely discussed today, even though it may have major implications for oceanic accretion. Current models do not explain the development of these magmas or their evolution or role in accretion. As the corresponding rocks are not yet accessible by drilling and do not outcrop on the ocean floor, we propose a study of the Moho transition zone in ophiolites. In particular, we take advantage of the large-scale structure known as the Oman ophiolite, where on- and off-axis accretion zones have been identified, to conduct detailed microstructural and petro-geochemical studies and to understand the processes of the circulation and emplacement of the magmas. New isotope data will identify and quantify the interaction between magma (via assimilation, remelting, and other processes) with the already partially cooled and hydrothermally altered (thus, off-axis) lithosphere. 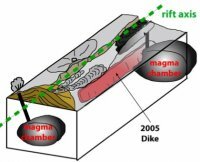 Magmatism that corresponds to shallower levels of the magma chamber will be studied in order to understand the accretion of the lower oceanic crust (accreted from superficial magma lenses or directly from mantle magmas). A comparison between today’s oceanic crust (IODP 1256D drill, dredging of Hess Deep) and the ancient oceanic crust (Oman ophiolite) will be conducted using petrological and geochemical tools. We will also examine how all of these processes which are characteristic of magmatic accretion at oceanic ridge segments are initiated and maintained. To do so, we will conduct a comparative study of magmatic processes and their interactions with tectonic activity in the active rift axis of the Afar depression (Ethiopia) in the context of an Ocean-Continent Transition (OCT). Magma-rock interactions are critical processes for the creation, evolution, and transfer of magmas within the mantle, through the crust, and up to the surface. These interactions particularly affect the composition of primary basaltic magmas, masking the melting process within the mantle and smoothing mantle geochemical heterogeneities. The objective of this study is to understand the influence of these interactions on the composition of magmas, as well as on the material through which these magmas percolate by characterising these interactions, based on the associated physical parameters , at mantle and crustal conditions (pressure, temperature, composition of phases [liquid and mineral], and redox conditions). We propose to study natural samples by combining petro-geochemical studies with numerical modeling, in conjunction with experimental characterisation of these processes. For transport within the mantle, numerical models (for example, MELTS) will be used to constrain the role of each of the physical parameters on the evolution of the composition of fluids and percolated rocks (composition and mineralogical mode). The results can be compared to natural samples that were previously identified as resulting from magma-rock interaction (e.g., Lherz Massif, France). These same samples will be used to characterise both equilibrium and kinetic fractionation between different phases (e.g., changes in Kd), and changes in redox conditions during the course of these interactions. An experimental study to determine the composition of the liquid in equilibrium with the mantle mineral assemblage at low pressure (0.3 and 0.5 GPa) will complete this project. Magma-rock interactions in the lower crust will be studied in Iceland, a key location for the investigation of magmatic processes. Partially melted xenoliths from various levels of the crust will be studied in order to constrain the interactions experienced by fluids during their percolation to the surface. Photomicrographs showing size and texture of gabbro xenoliths in pillow lavas from Midfell area, SW Iceland (Gurenko and Sobolev, 2006, CMP 151 : 495-520). (a) General view of a gabbro xenolith composed mostly of clinopyroxene (dark-green grains), plagioclase (grains having white, gray or beige color) and containing dark-brown halo of quenched glass. (b) Spongy texture of one clinopyroxene grain filled by naturally quenched glass. In this panel and panel (c), the small, white rounded blebs are gas vesicles in the interstitial glass presently filled by epoxy resin ; (c) Strongly resorbed CPX grains, subhedral PL crystals and interstitial glass demonstrating typical xenolith’s texture ; plane-polarized light ; (d) the same field of view as in (c) but given in cross-polarized light showing that all seen CPX grains compose a single oikocryst. OL = olivine, CPX = clinopyroxene, PL = plagioclase, GL = glass. The chemical and isotopic compositions of the different phases will be used to estimate the physical parameters, such as pressure, temperature, and redox conditions, and should allow for discussion of the impact of crustal contamination and potential interaction with meteoric fluids (e.g., isotopes of boron and oxygen). Typical uneven Al (A) and Fe (B) distribution in a spongy clinopyroxene composing Midfell gabbro nodules, which are thought to have experienced percolation of hotter, more primitive basaltic melt. We believe that such process of melt percolation may result in a pronounced Sr excess observed in many Icelandic tholeiites (Gurenko and Sobolev, 2006, CMP 151 : 495-520).